To do their research, astronauts would float in a space station above Venus' toxic clouds. Venus is not a hospitable place for humans. The planet is covered in thick, billowing sulfuric acid clouds, underneath which temperatures reach nearly a thousand degrees Fahrenheit. If you were unfortunate enough to stand on Venus’ volcano-spotted surface, you would feel 100 times more pressure than you would standing on the surface of our own planet, in large part due to its atmosphere. Naturally, NASA scientists have a lot of questions. A team of them recently announced Project HAVOC, which stands for “High Altitude Venus Operational Concept.” The project details how a 30-day, manned mission to Venus might go down. And while the operation is purely speculative — much of the necessary technology doesn’t exist yet — it marks the first serious plan for how people might explore our nearest planetary neighbor. Even though this announcement arrived alongside news that NASA’s goals don’t match what the American public wants NASA to be doing (the White House scrapped climate research for more moon missions, the public wants the opposite), no one around here is complaining about this proposal. Because it’s an undeniably-cool sci-fi vision come to (theoretical) life. 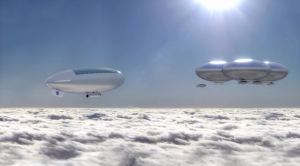 In order to study Venus and search for signs that the planet may have once had a more hospitable climate and, perhaps, even water, the NASA engineers envision a gigantic, floating research colony. The research station would hover about 50 kilometers (30 miles or so) above the acidic clouds, in an area of the atmosphere that stays at a cooler temperature. The proposed plan is more than a little risky (someone should get on those movie rights ASAP). After reaching the planet, the manned shuttle would attach to a separate rocket that contains the deflated, folded research station. As it plummets towards the surface, the station would deploy a parachute, unfold itself, fill with tanks of helium sent for the ride, and then (hopefully) stay afloat at a non-lethal altitude. After a month of research from the strategic position above the clouds, the crew’s shuttle would have to detach from the research station, rocket back into orbit, and rejoin the orbiting spacecraft that would take it back to Earth. All in all, the trip would take less time than a manned mission to Mars, since Venus is much closer to Earth. But if it all sounds pretty ambitious to you, well, you’re not alone. While NASA still hasn’t developed the technology necessary to complete such a mission and, you know, keep the astronauts from dying, the agency feels that the tech we do have is good enough for similar, smaller-scale robotic missions that could begin to scan Venus for signs that our planetary neighbor used to sustain life.